The final push is nearly here. The week of September 17-24 marks the last crazy stretch of games for Ballpark Tour 2014: TB, MIA, PIT, TOR, DET, & CLE. But before any of that, I gotta get myself to Target Field in Minnesota. Originally, I had planned on visiting Target Field for the All-Star Game back in July. I started looking at finances and calendars and couldn’t quite swing it. I figured Minneapolis is such a quick flight from Kansas City that I could go pretty much anytime. Between the Twins schedule and my own, there were only a couple options, and I settled on tomorrow, September 3, against the Chicago White Sox. The matchup is what you’d expect from the two bottom dwellers in the AL Central…not great. Like I said, not necessarily a marquee matchup. John Danks has the 6th worst ERA in all of baseball for pitchers with at least 20 games played: 4.88. He’s been particularly bad against Minnesota too. Twins batters have hit at a .323/.384/.497 for their careers against Danks. Joe Mauer in particular has owned the Chicago lefty: 22 for 56 (.393). Mauer has more plate appearances against Danks than anyone else in the league too. The Twins’ Trevor May is still looking for his first big league win: he’s 0-4 in four starts with a 10.42 ERA (22 ER) in just 19 innings. Never good to have more runs allowed than innings pitched. He has made it into the 6th inning only once (vs DET two weeks ago) so I’l probably get to see a lot of bullpen from the Twins. Should get a lot of offense in this one – I’ll predict the Twins win 9-7. The activity should keep me from scoreboard watching too much, but let’s be honest, I’ll be watching the Royals score very intently. In fact, Target Field has free WiFi throughout the stadium, so there’s a good shot I’ll be on the MLB At Bat app streaming the Royals game from my seat. What a wonderful world this is. 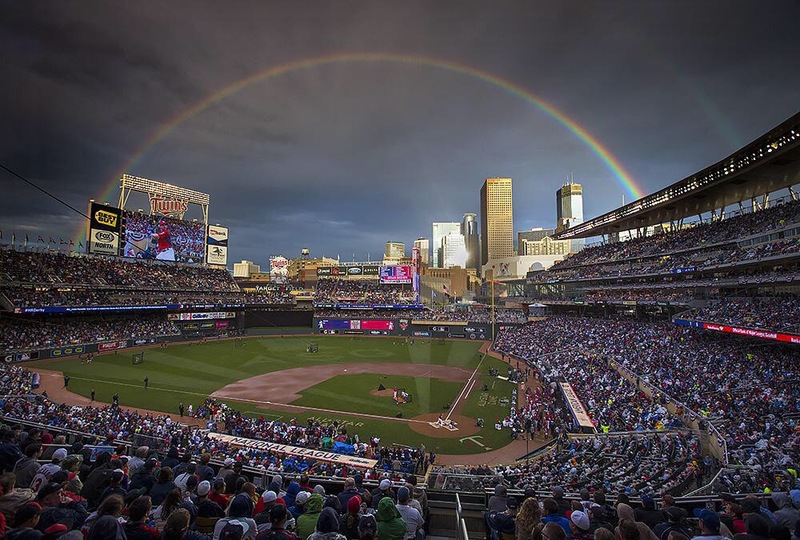 Photo cred: Props to Brian Dozier of the Minnesota Twins who took this photo of Target Field during the All Star Game this past July.